Isabel Garcia (center) relaxes with the group she mentors (from left), Sara Martinez-Sanchez 20C, Jenny Becerra 18C, Jaylan Jacobs 20C, Xiqin Huang 18N, Audrey Balan 19C and Tak Chi Wan 18B. As a high school student in Fort Wayne, Indiana, Jalyn Radziminski-Smith 18C was already taking college classes and preparing to apply to a list of Ivy League schools. When she was accepted to Emory, she envisioned a bright future where she could pursue all the opportunities offered by a high-profile private university. In her first few weeks on campus, however, the first-generation college student was homesick and a little overwhelmed by the social, academic, and pragmatic realities of college life. Then she received an invitation to participate in the first cohort of 1915 Scholars. Launched in fall 2013, the 1915 Scholars Program is designed to provide a support network for first-generation college students who might struggle with the transition. Admission requirements include a family income of $100,000 or less and the inability to go to college without scholarship support. Each student is placed in a “family unit” made up of alumni, students, staff, and retired faculty. 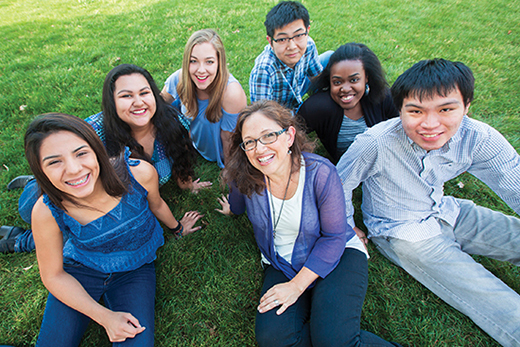 The students meet regularly with members of this family group — individually and as a unit — during the academic year.